Earlier this month, Charmin announced the winner of the ninth Cheap Chic Weddings Toilet Paper Wedding Dress Contest. Mimoza Haska of South Carolina was flush with joy when her design won her the top spot in the competition's finale in New York City. Cheap-Chic-Weddings.com, a money-saving website for brides-to-be, began the annual contest nine years ago. This year is the third time Charmin has partnered in the competition, providing coupons for entrants to cover the cost of purchasing the rolls of toilet paper, ranging from two to 40 rolls for some gowns. Haska's winning dress, which she named "Beautiful Swan," showcased a bustier top and asymmetrical hem. According to NY Daily, it took 16 rolls of Charmin Ultra Soft to create the gown. To finish the dress, Haska used glue, tape and thread - the only permitted additions to toilet tissue, according to Charmin's rules. The Charmin Facebook page indicates that Haska beat 1,100 other contestants in this year's wedding dress challenge. The contest's sponsors, Charmin and Cheap Chic Weddings, a website dedicated to inexpensive ceremonies, selected ten finalists from this pool of applicants. 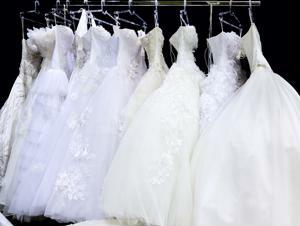 After a fan vote, the top three finalists were sent to New York City for the final stage of the competition, where they were judged by a panel of bridal industry experts. One of this year's judges, Project Runway's Season 11 contestant Kate Pankoke, was proud of all three finalists. "As a designer who specializes in bridal, I was particularly impressed with the level of creativity the three finalists brought to their designs," said Pankoke in a statement for Charmin. "It was incredible to see how they used Charmin toilet paper to create soft and sturdy gowns that are as beautiful as those made from fine fabrics, and Haska's dress was stunning!" Haska competed against Susan Brennen and Carol Touchstone. Brennen, a cheerleader for the Detroit Pistons, won the last two consecutive wedding dress competitions. Her entry this year was a halter gown with a detachable, full-bodied skirt, made of 11 jumbo-sized rolls of Charmin Ultra Soft. "That was my favorite dress that I have made," Brennan told the Detroit Free Press. "I thought it was a very interesting concept." Touchstone, a shop owner from Fort Lauderdale, came in third place with a dress she named "Coastal Wave." The news source reports Touchstone drew inspiration from the ocean to create her gown. She used 30 rolls of bathroom tissue to bring her design to life.